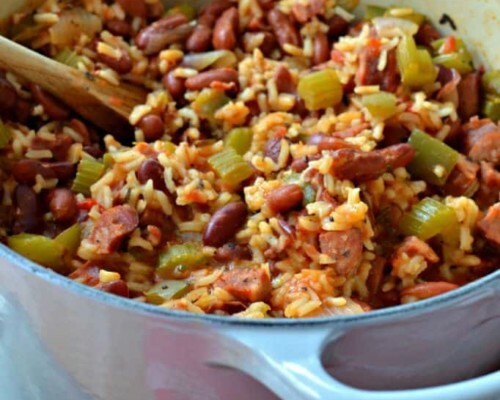 Red Beans and Rice is a mouthwatering combination of onions, peppers, celery, Andouille Sausage, red beans, rice and a perfect blend of spices. Heat oil over medium heat in dutch oven or heavy stock pot. Add onion, pepper, celery and sausage. Cook for 5 minutes or until the onion softens and sausage lightly browns. Reduce heat to medium low. Add garlic, oregano and Cajun seasoning; cook for 1 minute. Add red beans, chicken broth, tomatoes (if desired) and rice. Make sure that the rice is down in the broth. Stir to combine and bring to low boil. Reduce heat, cover and cook for 15-20 minutes or until rice is tender. I like to add tomatoes however if you want a truly authentic Cajun recipe leave them out.